It’s pleasure to take photos of a beautiful girl and it’s double pleasure when my clients are two beautiful girls who fall in love. 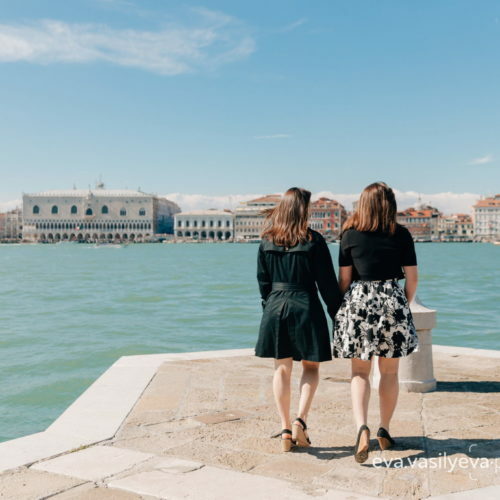 Cristina and Kristy were planning their travel in Venice in May. It’s a perfect time when the weather is warm but not hot yet. However, May is a high season in Venice, especially during the week of the Venice Biennale opening. So it was great that Cristina wrote me a few months before the arriving date and ask to help her with arranging the surprise proposal. For Cristina, it was convenient to hold the shooting time at the daytime so I recommended the San Giorgio island to avoid a crowd of tourists. This place is a really good place for a proposal with a great view of Venice. You can look another my proposal photo shoot there by the link. I emailed Cristina detailed plan of our meeting so we were prepared very well. The weather was sunny and warm on that May day. I was waiting for the girls like a tourist on San Giorgio and asked occasional tourists not to occupy our meeting place. 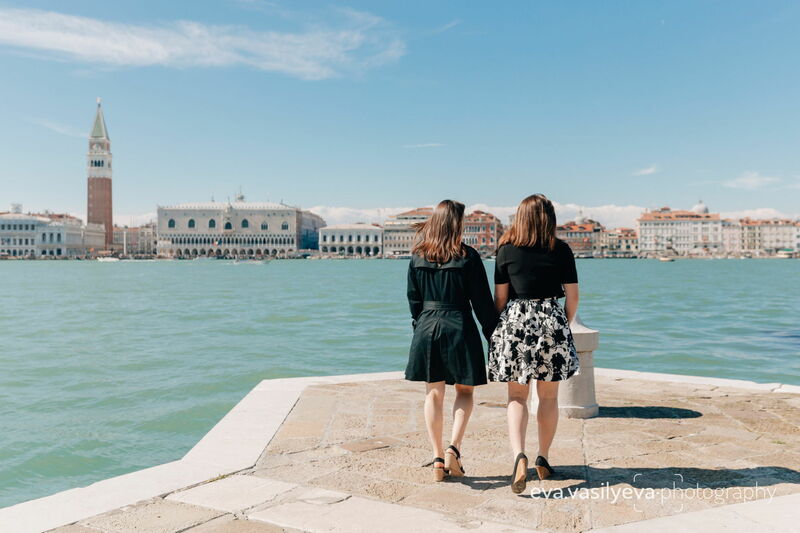 Cristina and Kristy walked over to the place with the gorgeous view, no one else was around, took a few selfies by phones, stayed close each other and admired Venice. In this romantic moment, Cristina got down on one knee and popped the question. Kristy said YES, through smiling and tears. It was so emotional! Then we came back to the center of Venice and took pics around St. Marko area. At the end of the shoot, we hired a gondola during which I accompanied the girls and took beautiful photos on the Grand channel with a view of the Rialto bridge. However, it is not said in vain that it is better to see once than to hear one hundred times. So let me show you the photos from this proposal photo shoot.